Surprise your kids with their own art show. I used to work at The Stephen L Clark Gallery , where I took full advantage of my employee discount. My husband and I love to collect art and pretty much have something hanging on every available wall space. 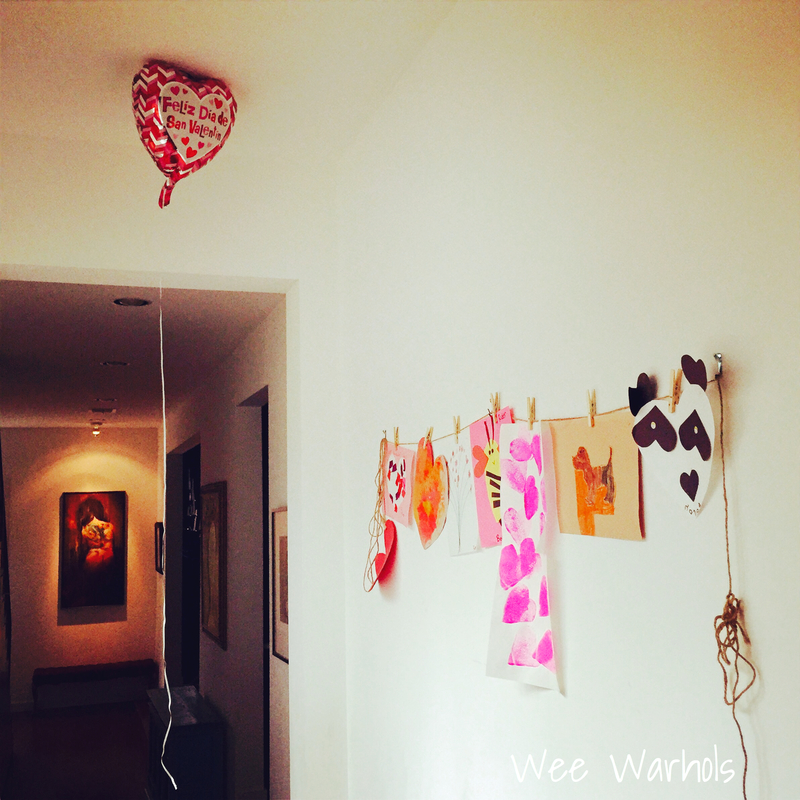 Around Valentines Day last year my boys came home from school with so many adorable art projects. Instead of filing them away or recycling them, I decided they needed an art show of their own. I took down some of our “grown up” art and hung a laundry line clasping their art using clothespins. This may seem simple, but when I called the boys down, they were so excited to see their work properly displayed. I changed up this hallway that they live and play in everyday and made it about them and their artwork. We enjoyed the show for a few days, then took the art down and dispersed it to lucky loved ones. 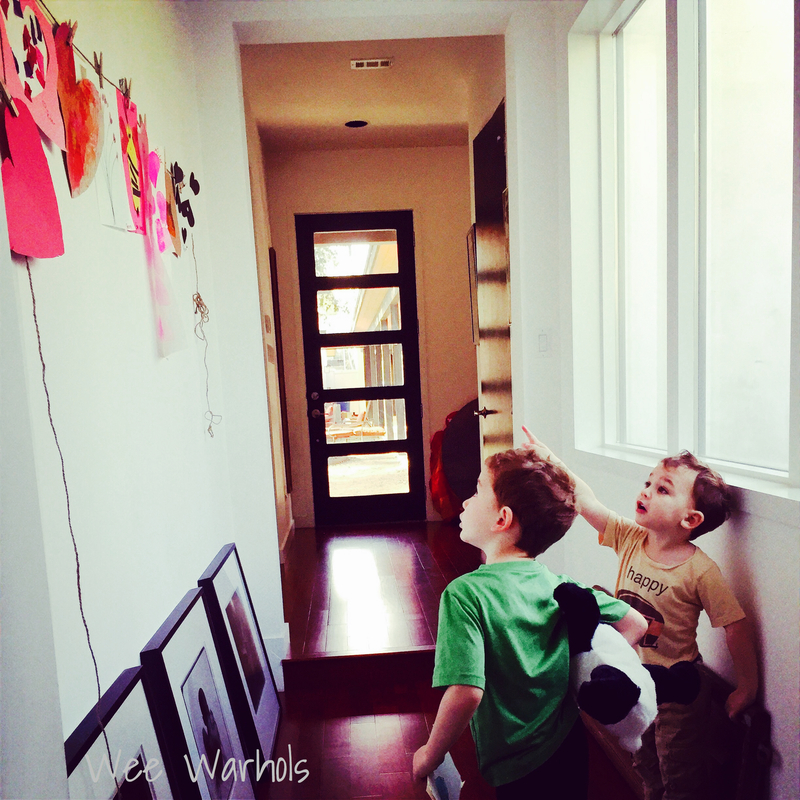 The boys make SO much art at home and in our Wee Warhols art classes. I am constantly switching out art on their bedroom art walls and around the house. Sometimes I have to remind myself that it is about the process and not the product, and sadly I am forced to recycle old art. Otherwise we would drown in it. One of my favorite ways to display children’s art is an art collage that I saw on the Novogratz television show Home By Novogratz. Paper and Cakery has a wonderful blog post Home By Novogratz: Kid Art Gone Cool describing the collage project, as well as other great display ideas. Check it out! 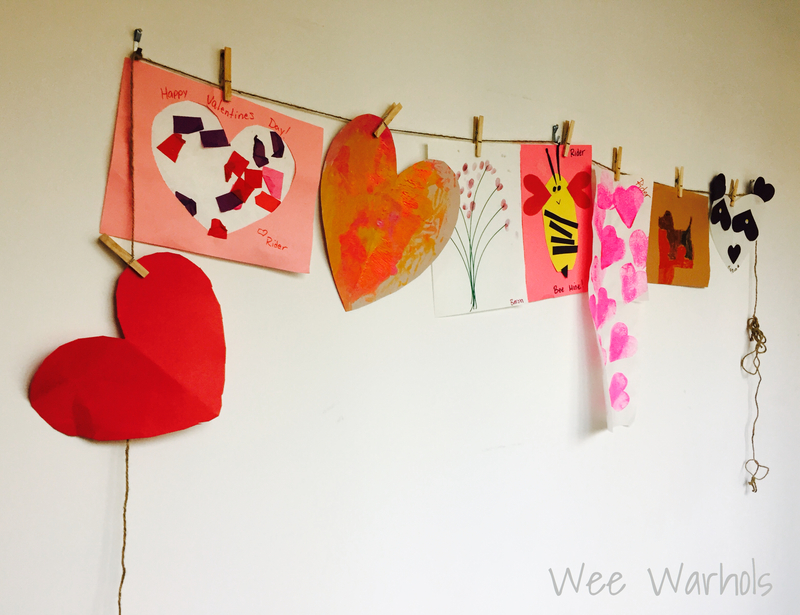 Another gorgeous idea as well…my kids love getting involved, and this would be a really lovely idea for displaying their art. Thanks for taking part again. Thanks, Helen. Happy to be included.